COMPATIBLE: for iPhone 6/6s Plus (5.5â) & iPhone 7 Plus WITH NO CASE; for Galaxy Note 4 5 WITH NO CASE; for Google Nexus 6P and LG G5, G4, G3 with NO CASE; See Product Description below to ensure you find the right fit for your smartphone. SO COMFORTABLE YOU BARELY KNOW ITâS THERE – This running sport belt fits so comfortably youâll barely notice it during your workout. Great for both men and women, the adjustable, soft strap holds firmly without bouncing, slipping or feeling too tight as you move freely through your exercise. 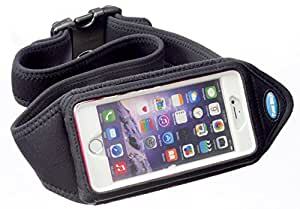 PROVEN CONVENIENCE FEATURES â Tune Belt sport belts feature an extra pocket on the back for storing personal items like ID, cash or credit card and access holes for Earphones or Lightning Connector. Touch control window allows use of smartphone while in the waist belt. Front side opening with elastic strip provides protection & convenient access. RELIABLE BRAND & AUTHENTIC QUALITY â Tune Belt has over 30 yearsâ experience taking care of customers and providing excellent customer service. Our products will not tear or fall apart with regular use in the gym or outside. High quality materials ensure a durable product that you can hand wash to keep clean while it lasts for years to come.